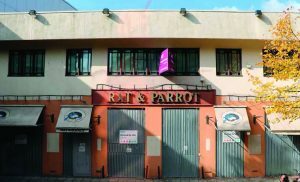 THE derelict Rat and Parrot pub in Woking town centre could be replaced with a 12-storey block of flats targeted at commuters and first-time buyers. Its owners have applied for permission to demolish the building in Chertsey Road and build a tower of 68 homes on the site. The Rat and Parrot closed in 2009, after failing to compete successfully with the popular Wetherspoons pub on the other side of the road and other drinking establishments in the road. The increasingly scruffy pub has long been boarded up, with nearby business owners complaining that it makes that end of town unattractive to shoppers. The owners of the single-storey building, London-based investors Mike Watkins and Richard Lewczynski, say they want to provide homes in the town to avoid using Green Belt land for housing. The design statement to Woking Borough Council says: “The site is close to all the town centre services. It is just three minutes walk from Woking station, and with frequent express trains into Waterloo you can be in central London within half an hour. The planning application is for 50 one-bedroom, 16 two-bedroom and two three bedroom flats in a 12-storey block, with associated landscaping and parking areas. It follows permission being granted last December for the under-used Elizabeth House and Cornerstone office blocks in nearby Duke Street to be converted to 158 flats. The Rat and Parrot building was one of the originally “pile it high, sell it cheap Tesco supermarkets in the early 1970s. It was a furniture store before being converted to a pub.